We are pleased to recommend the following lodging providers because of the quality of their facilities and services, and for the courtesy they extend to our guests. You can book your lodging directly or, we will gladly book your lodging and add the charge to your rafting invoice. 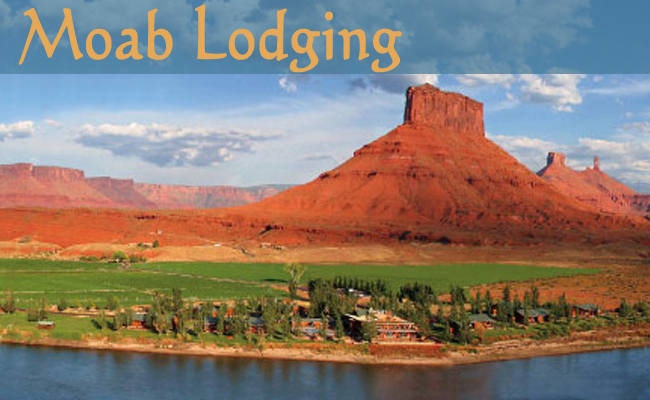 For a complete list of places to stay in and around Moab visit: www.discovermoab.com. Beautiful rustic lodge located on the Colorado River on Scenic Byway 128, 16 miles from Moab / Private patios on the Colorado River or Castle Creek. Downtown fun and comfort with splendid quality suites, adjoining rooms and private balconies. Great in town location near shopping – lodge style décor, on-site steak house restaurant. Convenient, cozy and affordable western style near shops and restaurants. Mature landscape and gardens, private & quiet, many rooms with access to pool patio, 2 blocks from Main Street. Secluded 4-diamond historic farmhouse and garden cottage, luxurious comfortable décor, 3 blocks from downtown. Southwest adobe style on an acre of desert landscape, next to the Colorado River and Matheson Wetlands Preserve, 8 blocks from Main Street. Late 1800’s Victorian home secluded from traffic and noise yet 2 blocks from shops and activities. Canyonlands Campground Shaded downtown park with RV, tent & group sites, air-conditioned cabins, 30 & 50 amp hookups, shade huts, pool, laundry facilities, store, and RV supplies. RV, tent and group sites, air conditioned cabins, 20-50 amp service, store, RV supplies, laundry facilities, next to Matheson Wetlands Preserve. With easy access to and from the hwy, wide interior roads, and long, spacious pull thru sites, big rigs are easily accommodated. Every site has shade trees, sidewalks, thick green grass, a picnic table, individual parking space, and full hookups with free cable TV service. 3227 S. Hwy 191 near Sheri Griffith Expeditions; 57 tent site,65 RV sites, picnic tables, dump station, showers, pool, store and laundry facilities.